Mikhail Saakashvili, former Georgian president and former governor of the Ukrainian Odessa region, is surrounded by his supporters at a rally near the Justice Ministry in Kyiv, Ukraine, May 30, 2017. Saakashvili was stripped of his Ukrainian citizenship Wednesday. Ukrainian President Petro Poroshenko stripped former Georgian President Mikheil Saakashvili of his Ukrainian citizenship Wednesday, leaving him effectively stateless. Saakashvili became a citizen of Ukraine and was appointed governor of Odessa by Poroshenko on May 30, 2015. Ukraine’s State Migration Services posted a statement July 26 mentioning Saakashvili by name and citing laws under which citizenship could be revoked, such as by submitting false documents with a citizenship application. The statement also mentioned unspecified documents recently sent by Georgian authorities. The immigration service stated that Saakashvili’s case, including the newly obtained documents, had been sent to the citizenship commission. 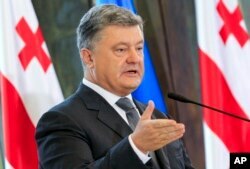 According to Ukraine’s constitution, the president makes “decisions on losses of Ukrainian citizenship based on the conclusions of the citizenship commission,” the statement said. Anton Garashenko, an adviser to Ukraine’s interior minister, said in a post on Facebook that Saakashvili’s citizenship application had not indicated any legal proceedings were outstanding against him, in Ukraine or elsewhere. However, at the time he was applying, a Georgian court had issued a warrant for his arrest in absentia; Saakashvili is still wanted in Georgia. Neither Poroshenko nor Saakashvili responded to media requests for comment. Saakashvili resigned as governor of Odessa last November after a dispute about the government’s alleged failure to take action against corruption. He then established a new party, the Movement of New Forces. The party said Wednesday on Facebook that it had no information about the revocation of Saakashvili’s citizenship. “If this information is confirmed, it will mean that Petro Poroshenko, in the spirit of his predecessor, has irrevocably gone down the path of unconstitutional action for usurpation and holding on to power at all costs,” the party said. Georgia’s ambassador to Ukraine, Gela Dumbadze, confirmed to Rustavi2 television that Poroshenko signed the order to suspend Saakashvili’s citizenship. Saakashvili was president of Georgia from 2004 until 2013. He left Georgia after his term expired and after his National Movement Party lost its parliamentary majority in the 2012 elections, amid accusations of criminal activity, all of which he denied, declaring such charges were politically motivated. Authorities in Tbilisi revoked Saakashvili’s Georgian citizenship in December 2015, an automatic action when a Georgian citizen obtains a passport from a different country. Georgia is seeking to extradite Saakashvili to face criminal charges arising from his time as president; he has been accused of calling for the use of force against protesters and of ordering a raid on the private television station Imedi. He has denied the charges and accused the current government of political persecution. Ukrainian President Petro Poroshenko speaks at a press conference in Tbilisi, Georgia, July 18, 2017. Poroshenko is on an official visit to Georgia. During a state visit to Georgia July 18, Poroshenko said he was unaware of any request for Saakashvili’s extradition. However, he later clarified his statement, saying instead that the Ukrainian prosecutor’s office had refused to extradite Saakashvili because of a lack of documentation. Last week, before Poroshenko revoked Saakashvili’s Ukraine citizenship, Georgia’s prosecutor general noted that the former Georgian president’s new nationality would be “an obstacle” to his extradition.